Just north of Seattle from I-5, you'll want to take exit 182 on State Route 525 north towards Mukilteo and Whidbey Island. There you'll take the Mukilteo Ferry for a 20 minute ride across the Possession Sound to Whidbey Island. Keep in mind that while waiting for the Ferry, motorcycles go to the head of the line!! Once on Whidbey Island, SR 525 continues heading north now you just need to look for where SR 20 intersects SR 525 and take SR 20 all the way up to Anacortes. After breakfast/brunch in Anacortes you can backtrack south or if you're in a hurry, just take SR 20 east straight over to I-5 (about 16 miles). I suggest you backtrack! You can start this ride from either end. I suggest starting from Mukilteo and catching the Ferry to Clinton. You will experience open fields to twisty mountain curves on Washington's beautiful Whidbey Island. The high light is Deception Pass, 3/4 of the way to Anacortes... 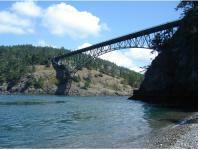 The gateway to San Juan Islands. That's another story. Bring a camera, I know - Duh! ...AND binoculars for Bald Eagles. Roads are fine. Free of grooves and chuck holes. Many banked curves! WooHoo! Pass state park had fantastic views and camping. Also, while in Mukilteo I suggest you visit the Mukilteo light house! on April 22, 2015 1 out of 7 members found this review useful. I rode this today and I was quite disappointed. I rode up I-5 and caught the ferry no problem. Once I was on the island everything was going fine for the first 20 miles or so but then the wind slowly started to pick up more and more. Eventually it got so bad that I was blown off the road onto the shoulder and decided it wasn't worth crashing and turned around. If you go on this ride make sure you have a big hog or pick a non windy day. I am a very competent rider and have never been more scared on my bike in my life. on September 12, 2014 0 out of 0 members found this review useful. Good road, lots of traffic (don't these people ever go to work and stay there!). Optional is to cross on the ferry over to Port Townsend (actual Hwy.20) and take Hwy. 101 south to Olympia or west to Port Angeles. on April 13, 2012 0 out of 1 members found this review useful. Long highway, high traffic, not much scenery until Deception Pass, which is incredible. Not very exciting road, very windy after Deception Pass. on June 30, 2010 0 out of 1 members found this review useful. Took the ferry from Mukilteo, would reccomend waiting a bit for traffic to clear, the drive was nice but the lack of passing zones and 2 lanes only left me doing 35 MPH for the entire trip stuck behind some bluehairs in their R.V. nice scenery, but pick an off time to ride it. on September 22, 2009 0 out of 0 members found this review useful. I did this route today like Taso suggested (circling to 9 in sedro-woolley) and it was amazing! Though whidbey has wonderful scenery I almost enjoyed taking 9 from sedro down to 522 better. My 06' 636 tore those twisties to pieces. on August 2, 2008 0 out of 0 members found this review useful. I rode from Seattle up to Mukilteo today and did this ride. On the way back instead of backtracking, I followed 20 East until it met 9 in Sedro-Woolley, then took 9 South all the way down to 522 West back in to Seattle. Highly recommend this way. SR9 is a really nice ride. There were some nice twisties along the way, especially between Sedro-Woolley and Arlington. Very nice ride. So much to see and so many side roads to explore, twisties included. One of the better routes from south west Washington up to Anacortes for the Oyster run.